There are four major types of add-on iPhone lenses: wide angle, telephoto, fisheye and macro. Each captures images from a different perspective. Wide angles scoop up more real estate into your image, so they are great for large groups of people or landscapes. Telephotos magnify your subject letting you keep your distance and zero in on a great shot, so they’re ideal for wildlife, birds, and human portraits. Fisheyes are used mostly for dramatic special effects, producing exaggerated spherical images. Macros let you get super close up on your subject, enlarging tiny items that would be hard to capture with the iPhone’s lens alone. The iPhone X, 7 Plus and 8 Plus all have two 12-megapixel f/1.8 wide-angle lens rear cameras. The X has an f/2.4 (52mm-equivalent) telephoto lens while the 7 Plus and the 8 Plus have an f/2.8 (56mm-equivalent) telephoto. Single lens iPhones have featured a range of resolutions and apertures over the years. When shopping for a lens accessory, be sure to choose one that’s compatible with your model. The iPhones 6 and 7 may look almost identical, but the 7’s bigger lens is incompatible with many iPhone 6 add-on lenses. Note whether the lens works with a special companion app — some do, some don’t. Lens accessories are sold individually or in kits that include several lenses for a handy unified system. 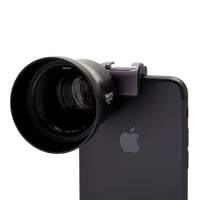 Some lenses require a case to attach the lens to the phone — which can be sold separately — while others ship with their own clips or mounts. Generally, case-based lenses give you a steadier hold, while clip mounts can be harder to adjust, or can shift with handling. 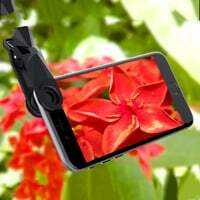 But clip mounts are more flexible for swapping between front or back cameras or even for use with different iPhone models. Ease of use is key. If you have to struggle to attach or swap out lenses on your phone, you’ll miss more than your shot: You’ll miss the joy of shooting. Lens kits often come with carrying cases and cloths to help keep your lens clean and ready for action. 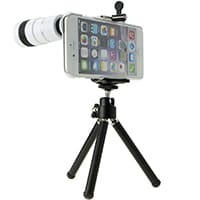 When selecting a lens or lens set for your iPhone, major considerations include optical quality, weight, and cost. Higher quality glass and casing materials cost more, and may have more heft. The choice boils down to your personal standards of quality, convenience, and image destination. Images destined for print or viewed on large, high resolution screens are an argument for buying the highest quality glass you can afford. If your work is strictly for online, social media, or other non-print or enthusiast destinations, you can get by with a bit less optical quality, as viewers will likely not notice a difference on screen. Some lens defects, though — like inaccurate colors, or blurry images — are obvious at any size. If you seek only a single lens type — like wide angle or telephoto for a specific shoot — it makes sense to concentrate on shopping for that one lens rather than going for a variety pack. While kits may offer a bigger bang for the buck, you will likely be happier getting the highest quality lens for your intended use. Then again, kits are appealing for their creative variety and future artistic challenge. Some kits are so reasonably priced, it makes perfect sense to start with a low-priced kit to see where your real visual interests are and then graduate to a higher quality lens later. 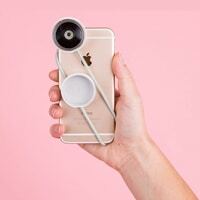 Add-on iPhone lenses have an inherent shelf life — which is generally associated with your phone model. Because of changes in iPhone design, there’s no guarantee that when you upgrade to a new handset you’ll be able to use your old lenses — though it’s possible in some cases. The best bet is to choose a lens for the phone you have today, or plan to buy in the near future. We looked at a range of lenses spanning the iPhone 6 all the way up to X — concentrating on the more recent iPhone generations. We considered both individual lenses and lens kits and lenses with cases and mounts, and zeroed in on a few of the best ones around. 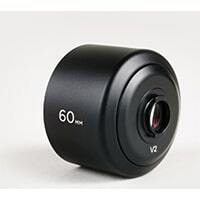 Moment is an all around favorite for top quality mobile lenses. The Moment Wide Angle, a versatile lens designed for the iPhone 7, 8, and X, features a distinctive curved hood, and lets you capture around double the amount of content of the original iPhone camera. The Moment Wide Angle attaches to your handset via the company’s Photo case or Battery Photo case (sold separately for $30) via a bayonet mount set in an aerospace grade metal housing. Just twist and lock to keep your lens safe while shooting. Moment’s 18mm design, featuring 0.63x magnification, is the ultimate landscape snapper — great for travel, architecture, large group portrait shots and for adding context to videos while avoiding cropping. This aspheric all-glass lens has a little bit of heft at 2.6 ounces, and delivers sharp images from iPhone’s F/1.8 aperture. You can use it with either of the iPhone’s dual rear lenses, while a companion app lets you choose in real time which one you want to use. Moment is widely acknowledged by photographers and tech pubs like the Wirecutter as a popular favorite of the genre. 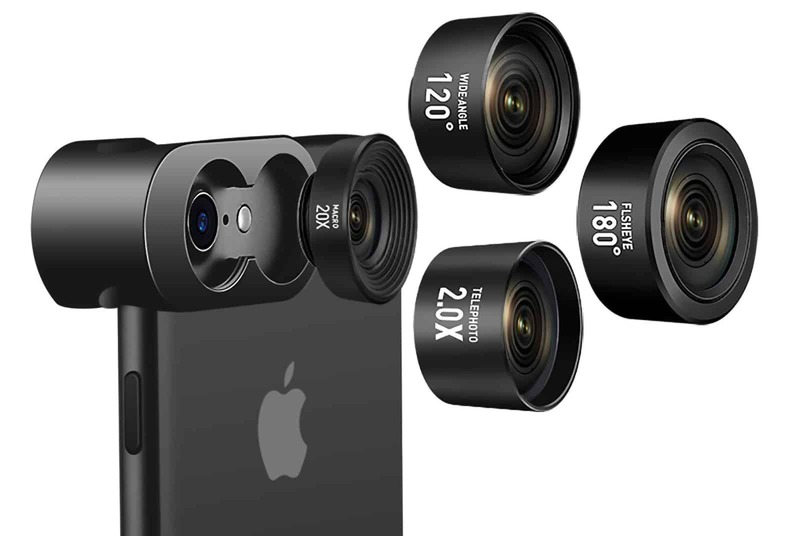 Sandmarc offers a premium kit for iPhone X featuring three high quality lenses and your choice of how to mount them. 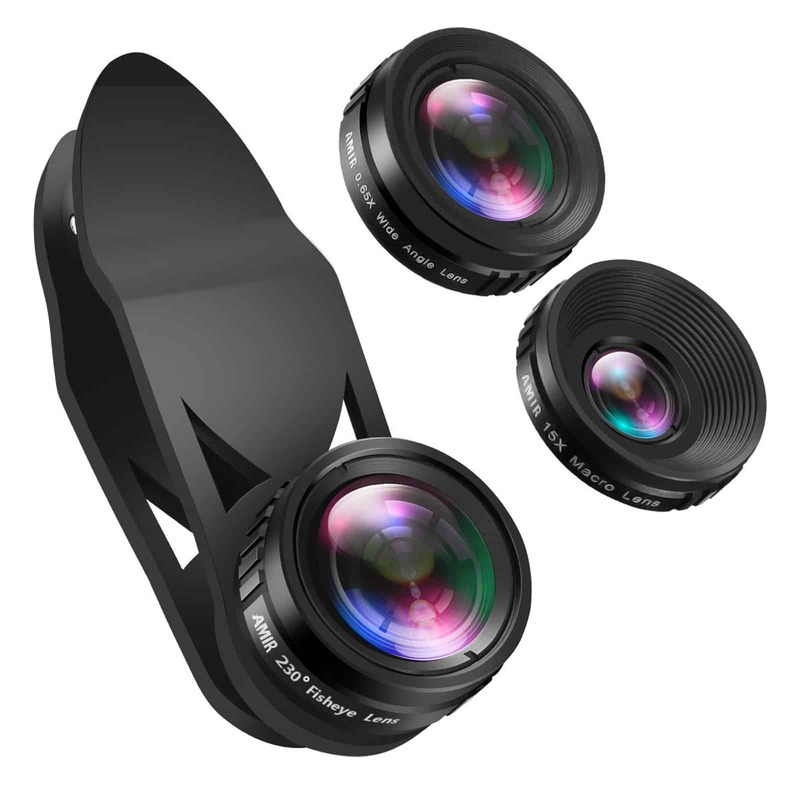 While Moment often dominates the scene for high caliber lenses, it meets some completion from Sandmarc’s Photography Edition, which offers a boss trio of multi-coated wide, fisheye, and macro lenses compatible with Apple’s flagship phone. Accompanied by a special case to which you must affix the lenses, the 16mm wide lens has 0.56x magnification, the 10mm fisheye lens has 0.2x magnification, and the 25mm macro lens has 10X magnification. Each lens has a dual mounting option — you can use the case or the clip, both of which are conveniently bundled into the package. With a little help from its companion app, the DxO ONE gives you the ultimate in lens add-on flexibility. The DxO ONE 20.2MP Digital Connected Camera for iPhone and iPad is unusual in that it attaches to your device via the Lightning connector and facilitates instant sharing with its Wi-Fi connectivity in a compact 14.1-ounce package. 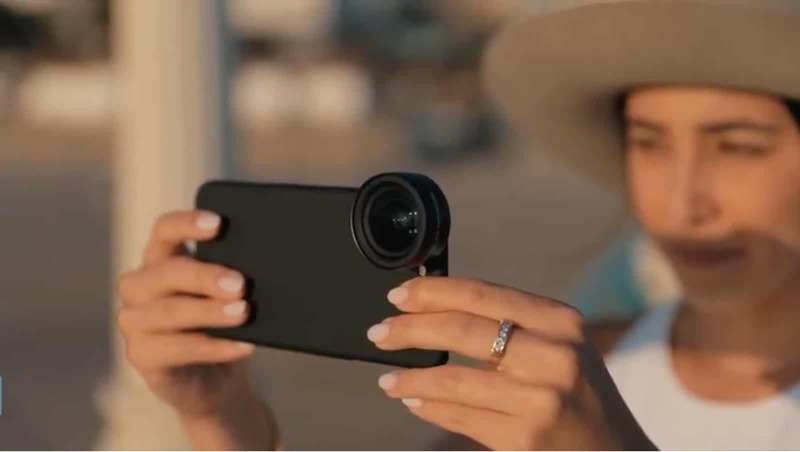 A huge favorite on Amazon, the DxO ONE transforms your phone into a humongous viewfinder from which you can shoot from any angle with a swivel. Alongside a powerful sensor, the DxO also packs an 8GB microSD card and rechargeable lithium-ion battery, so no worries about storage or battery life. It delivers high quality images even in low light with the lens’s six-element aspherical 32mm f/1.8 – f/11 prime lens. A companion app lets you choose shooting modes like Program, Aperture Priority, Shutter Priority, or Manual as you tap to select specific exposure and auto-focus. Easy clip-on lens lets you swap four different camera angles. This great favorite with the Amazon crowd features a four-in-one combo of 2x zoom telephoto, 180-degree fisheye, 120-degree wide angle, and 20x macro built with pro-level optical glass and aviation-grade aluminum. 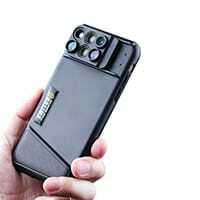 Regardless of which phone you own, the detachable clamps come with a device that can adjust and affix the lens clip to the front or rear lens according to the thickness of the phone, and without scratching. The package includes two different clips, designed for dual or single lens phones plus lens covers, carrying case, cleaning cloth, and dust remover. It’s compatible with almost any iPhone. The Amir Lens Kit takes the fisheye to extreme angles. 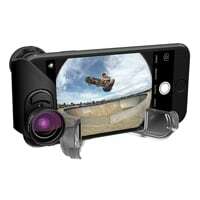 Amir takes iPhonopgrahy to extremes, expanding the range of its wide angle, macro, and especially fisheye lens. 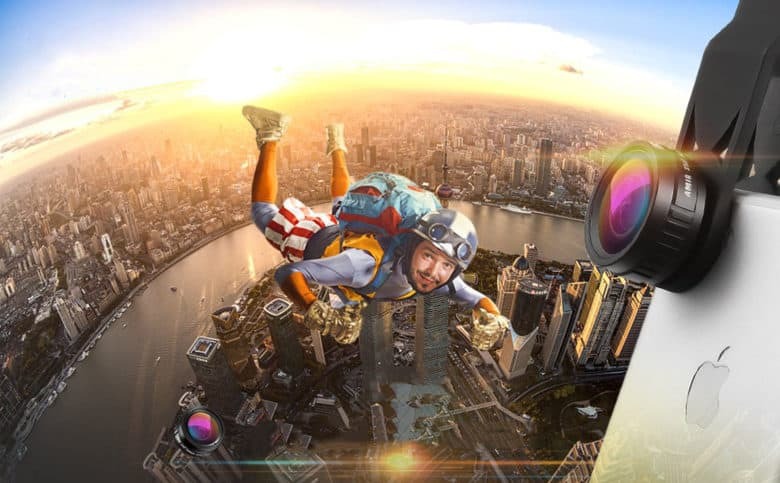 Taking it to the limit means you can shoot with 0.65x super wide angle lens, 15x macro lens, and a whopping 230-degree fisheye lens, for augmented special effects. Clip the lenses on to your caseless phone and fire away. It works with all iPhone models from 4 to 8 at a price that makes you smile. The 5 in one offers good quality for a great price. Amazon users rave about this neat smartphone set that’s compatible with most iPhones. Constructed of premium HD optical glass and aluminum casing, Shuttermoon’s universal clip is compatible with iPhone models 6 through X and with iPads. You get a 198-degree fisheye lens for a spherical image; a 0.63x wide angle lens for capturing expansive landscapes or fitting a large group of friends into a shot; a 15x macro lens letting you get up close to small objects; and a 2x telephoto for getting close to the action while keeping your distance. The kit throws in a CPL (circular polarizer/linear) lens for reducing reflections and enhancing color and sharpness. While the rest of the iPhone add-on lenses did not make the top cut for various reasons, many earned kudos from the roughest customer critics, so we still consider them worthy contenders for iPhonographers spanning various generations of iPhones. Now for a completely different form factor that gives you a six-in-one lens system no swapping. Quickly switch between the three sets of lenses that work specifically with the iPhone X’s dual camera system. The Ztylus two-ounce, dual optics design features a 120-degree wide angle, 2x telephoto, 10x Macro, 20x Super Macro, and 180 degree fisheye with an 18mm focusing distance. The slim case holding it all together has an ergonomic hand grip and a raised lip to protect your screen. While Amazon shooters gave it mixed reviews — with some users complaining about loose lenses — the price and convenience make it worth considering. If you have a single lens iPhone camera, the Amir may be the clip-on lens you seek. With its two-in-one aluminum construction, the Amir 15X macro pairs with the 0.45x wide angle to make a dynamic duo for outings at the park or traveling the world. Small and lightweight at 5.6 ounces, this lens lets you get right on top of your subject to shoot photos at under two inches away. A universal detachable clamp, made of soft rubber that won’t scratch or damage your phone, is compatible with several generations of iPhones from 4 to 8. The lens is water resistant so you can enjoy shooting in the rain. 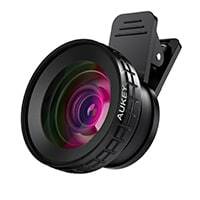 For a single lens clip-on ease of use, the Aukey Optic soft rubber clip has you covered. 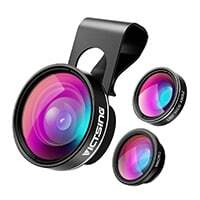 Made of aluminum alloy and multi-element coated glass, the kit includes wide angle, macro, and fisheye lenses in a gadget that lets you screw the wide-angle attachment to the 10x macro lens for a 110-degree wide angle view. The 10x macro lens facilitates extreme closeups (up to an inch from your subject). The 180-degree fisheye lens gives you a full image without dark corners. The package includes a traveling pouch and cleaning cloth. 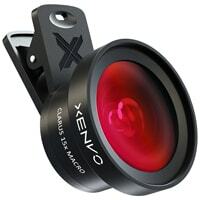 The Xenvo has some extra features that delight its Amazon users. In addition to its 0.45x wide angle lens and 15x macro lens, the package includes a lens clip, GlowClip Mini rechargeable LED light, charging cable, quick-release lanyard, case, and cleaning cloth. Just drape the lanyard and lens around your neck — the quick-release head makes it easy to detach the lens and clip it to your phone. The GlowClip light, with three brightness settings, clips anywhere on your phone to brighten your subject and surroundings with flattering warm, natural light — superior to the iPhone’s built-in flash. 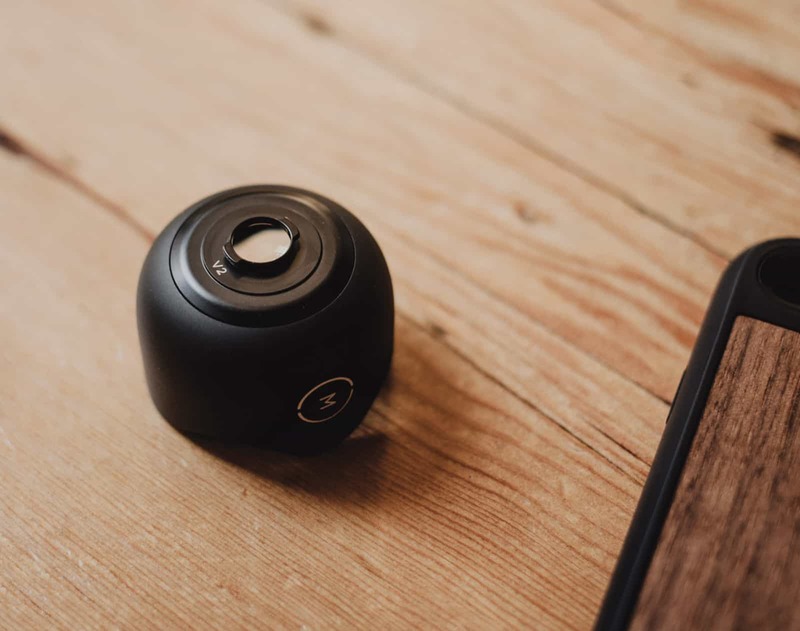 As a pocket-sized wearable tripod and lens holder, the Olloclip set attaches over your phone’s front and rear cameras for perfect optical alignment without additional cases or brackets. Compatible with iPhone 7 and 8 and the Plus models, the set features a 180-degree fisheye — great landscapes, portraits and group selfies. A 120-degree wide angle delivers nearly double the iPhone camera’s field-of-view. The 15x macro gets you close up on all the details. The clip, wearable pendant stand, lens caps, and microfiber cloth are included in the box. Oh, and the stand doubles as a tripod. A companion lens to Moment’s new Wide lens is the highly regarded Tele Lens — with a 60mm focal length that brings you closer to your subject. You can place it over either lens of the iPhone X, iPhone 7 Plus or 8 Plus for a 4x zoom. Like the new Wide, the Tele works only with the company’s new mounting system and specializes in portraits — images that stay sharp in the center while tapering off toward the periphery. Use it with either the Photo Case or the Battery Photo case. The Tele lens ships with a lens cap and microfiber bag. These days, a new kind of landscape and immersive documentary photography has become popular — shot with 360-degree cameras and viewable with a VR headset. 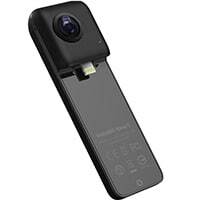 The Insta360 Nano S clips on to the iPhone Lightning connector for 4K ultra-HD 360 video and 20MP 360-degree photos. The Nano S features a multi view, chat, live 360-degree streaming, stabilization, and free capture, all from an f/2.2 lens. Compatible devices include iPhone X, iPhone 8/8 Plus, iPhone 7/7 Plus, iPhone 6s/6s Plus, and iPhone 6/6 Plus. The Mobile Photography Box Set, specifically designed for the iPhone X, features 180 degree fisheye, 120-degree super-wide and macro 15x lenses for a lightweight diverse field of view options. The spring loaded lens system aligns with your iPhone’s front and rear cameras, and expands to work with all screen protectors. It fits caseless iPhones, Olloclip cases, and screen protectors up to 0.5mm, but is not compatible with your phone’s flash. It includes the iPhone X clip, pendant stand, lens caps, and microfiber cloth. It’s compatible with most camera apps and can shoot video, time-lapse, panoramas and 360 degree VR photos. Users were pleased with the image quality, but reported challenges in keeping the clip steady. Use this lens to capture 360-degree images with your phone — with a little help from the companion PanoClip app. Just snap the lens on the top of your phone, and it sits securely with a built-in spring clip. The inner surface of the lens plastic is smooth so as not to damage your phone. 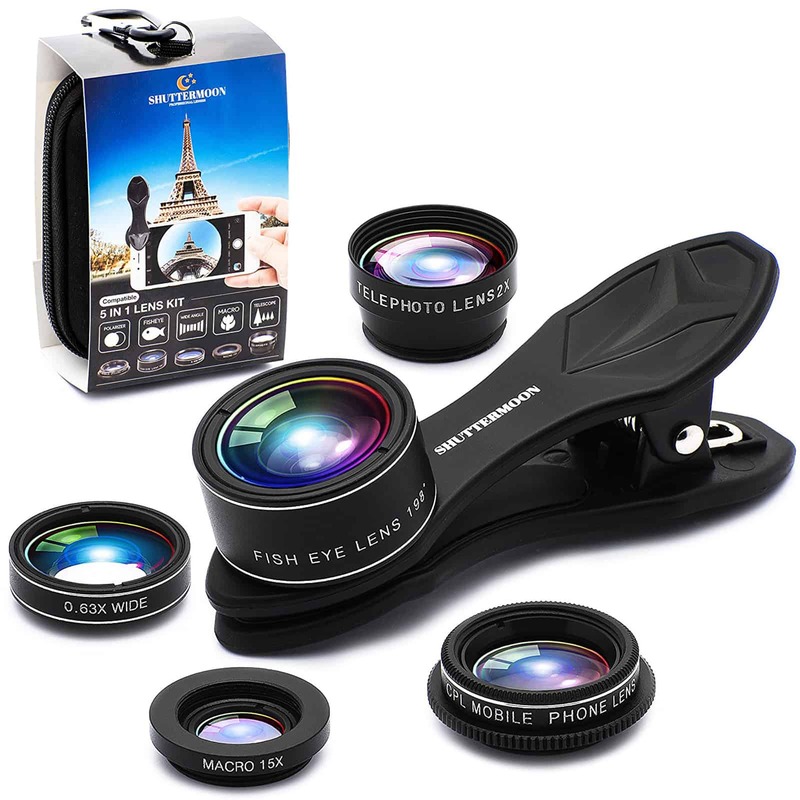 The panoramic lens is made of an anodized aluminum shell, ABS material, and double 180 degree fisheye wide angle lens. The lens housing is compact and easy to carry, and a protective bag is provided in the package. If you’re still toting your iPhone 6 or 6s, the three-lens set from Photojojo is on your street. The Iris Lens mounts over your case (up to 3mm thick). Leave the mount on and switch among the three lenses — wide, macro and fisheye — any way you want. It’s easy to affix and remove. Wide gives you a 100 degree field of view that captures what’s directly in front and to the side of you. The fisheye has a 180 degree hemispherical view for shooting rounded photos. The lenses fit snugly in the mount by friction, and while the whole contraption looks kind of low tech, it’s versatile and user-friendly. The mount converts into a carrying case for safe storage and transport. Older iPhones have maintained their popularity and for owners of the iPhone 6 or 6s, there’s good news on the lens front. The highly rated but affordable CamKix gives you an 8x telephoto lens, fisheye, and macro/wide angle lens — in a single, attractive kit. The package also includes a tripod, holder, hard case, cloth and velvet carrier. Just screw the lens directly into the case and shoot. The universal holder is compatible with a variety of phones — though not the 6s Plus model — and features a standard tripod socket. Zeiss is famous for its high quality camera lenses, so its 3x zoom telephoto lens (56mm equivalent) is a welcome addition for serious shooters. It features anti-reflective coating for brightness while an aluminum edge mount holds the lens securely. An integrated cold-shoe mount lets you easily attach lighting, audio and other accessories while an aluminum lens hood and lens cap protects your glass. A key-ring loop lets you tote the lens around safely. The ExoLens works with the iPhone 7, 6/6s, and 6 Plus/6s Plus. It may be an obscure brand, but it’s a strong Amazon favorite and a great entry into the add-on lens field. 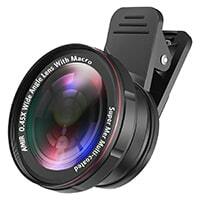 This clip has a 180-degree fisheye, 10x macro, and 0.65x wide angle lens packed into an aluminum alloy shell. It’s compatible with iPhone 7, 6s, 6, and 5s. An anti-slip design and non-skid rubber holds the lens steady and allows you to adjust the lens to the right place. It also ships with a lens cap and carrier. The Ora 2-in-1 lens kit packs a 140-degree wide angle lens and a 10x macro lens – the perfect combo for travel snaps, outdoors, close-ups, and selfies. Made of durable aluminum alloy and coated multi-element glass, the set is easy to use. Screw the lens onto the clip to align accurately with the device camera for a sharp image. The clip’s soft rubber contact points protect your iPhone from scratches. The package includes lens clip, carrying case, and cleaning cloth. Use it only with single lens cameras like the iPhone 8, 7, 6s, 6 Plus, 5s and 5C. Craving even more gear to make your iPhone photos the best they can be? 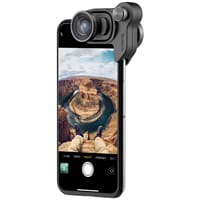 Check our roundup: Best iPhone camera accessories.